Year 10 and 11 students go behind-the-scenes working alongside GTAC scientists and exploring the biomed zone. When Molly Short first looked through the microscope at tiny liver cells she couldn’t believe her eyes. It was the first time the year 11 Sale College student had explored Hepatocytes. 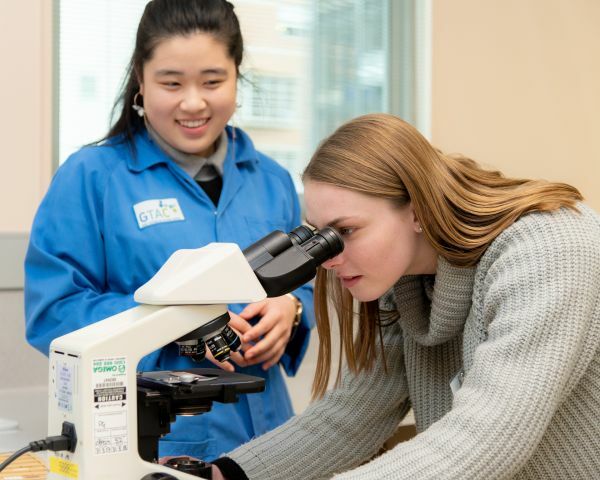 Learning how the cells help the liver with the transformation of carbohydrates was a thrill for the passionate science student. Sale College student Molly Short examines liver cells. 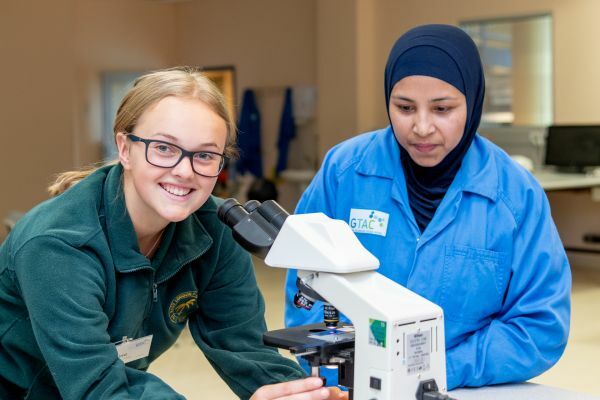 Molly and 60 other senior school students from rural and regional Victorian schools attended the fourth annual Biomedical Sciences Day on Friday 31 August. The event was presented by the School of Biomedical Sciences (SBS) and the Gene Technology Access Centre (GTAC). SBS head Professor Fabienne Mackay welcomed the students and shared her journey to biomedical academia, including her award-winning work to find the causes of Lupus – resulting in the first new Lupus treatment in more than 50 years. “Biomedical science is like studying a crime scene. You must investigate all the clues one by one to find the culprit – the thing that is causing the disease in the first place,” she explained. The students also heard from current SBS PhD candidates about their courses, the diverse research topics they are pursuing and life on campus. Emma Aquilina, year 11 student from Thomas Carr College, said: “Hearing from the students was excellent because you can speak to the careers counsellors and read up about it on the Internet, but nothing really provides the same amount of insight as hearing from people who are studying biomedical sciences at university right now”. 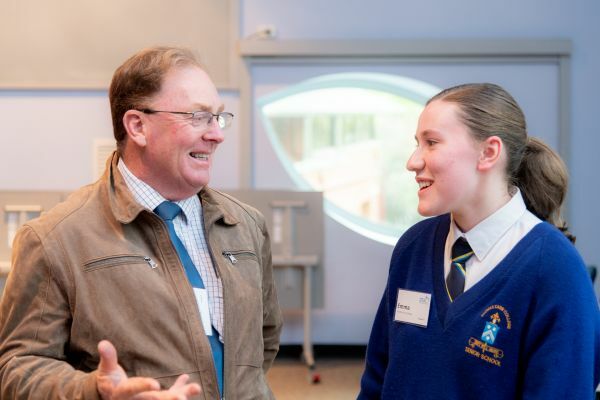 Teacher Peter McCarthy and Emma Aquilina from Thomas Carr College. Experience the Department of Physiology's Virtual Reality Learning Studio (VRLS). 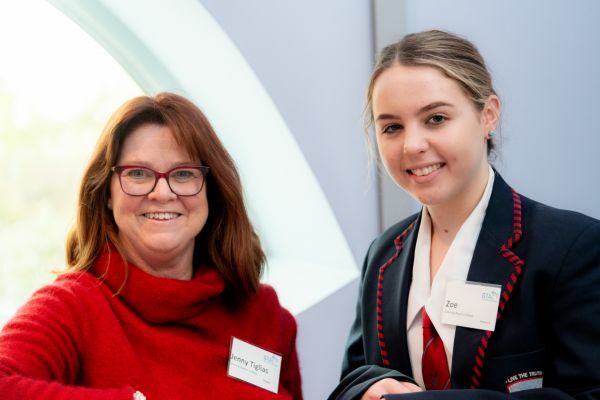 Amy Saunders, year 11 student from Mildura Senior College, said she hopes to follow in her older siblings’ footsteps and move to Melbourne for university. Mildura Secondary College student Amy Saunders wants to study biomedical sciences. 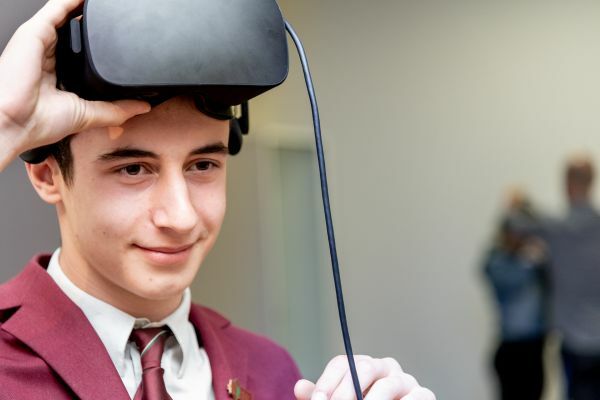 South Oakleigh Secondary College student Lefteri Tsitouridis experiments with virtual reality. The schools also learnt about Access Melbourne, a program that helps students from rural or regional areas gain entry to undergraduate courses at the University. Each year, 20 per cent of domestic undergraduate places are reserved for Access Melbourne applicants. 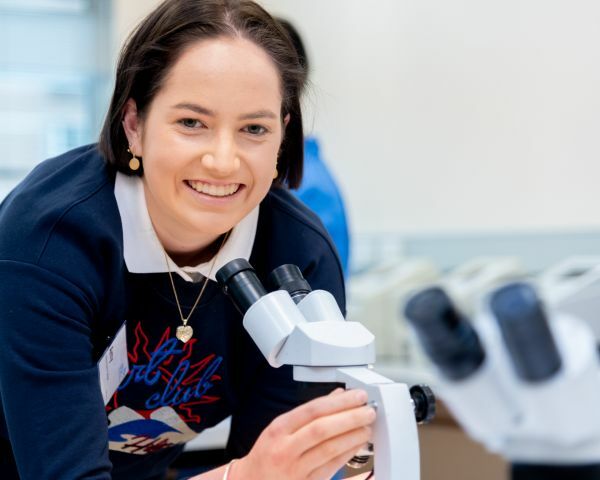 Zoe Brien, year 11 student from Geelong Baptist College who is interested in studying medicine, said it was reassuring learn about the different pathways into a degree. “It was also good to hear that people actually don’t know what they are going to do when they leave school, and often you just learn along the way,” she said. Zoe’s teacher, Jenny Tiglias, who also studied biomedical sciences, said the event provided students with a detailed understanding of what university life is like. Geelong Baptist College teacher Jenny Tiglias and student Zoe Brien. Sarah Pilkington, East Lodden P-12 College biology teacher, said her school has 230 students and limited science resources. East Lodden P-12 College student Jasmine Lawry and GTAC student mentor Musammat Nahar. Many students entered the Under the Microscope competition with photographs they had taken on the day of specimens using light, fluorescence and scanning electron microscopes. Inspired by discovering and learning new things about the human body at the event, the future looks bright for these budding scientists. For more information visit the School of Biomedical Sciences.